Fairhaven Regatta was a popular annual event at the Lake. The first one was held in 1900. BRILLIANT SUNSHINE AND A BIG CROWD. The usually quiet and unostentatious resort of Fairhaven woke from its lethargy last Saturday, and by its enterprise attracted a crowd variously estimated at from 5,000 to 6,000 people on the occasion of its second annual regatta and sports. The sports were held under the patronage of the Fairhaven Estate Company, and were carried through by a committee made up as follows. Chairman, Mr. A. M. H. Gardiner; vice-chairman, Mr. T. Rowe: committee, Captain Dandy, Mr. S. Green, Mr. J. Jackson, Mr. T. Rawlinson, Mr. J. M. Gillett. The judges were Mr. J.Peet and Mr. T. Hankinson, and the starter, Mr. H. Nottingham. Although the programme consisted of but twelve events it must have been extremely gratifying to the promoters to have such a response. 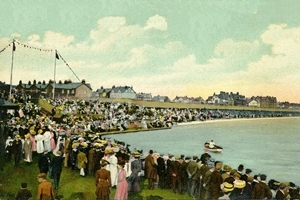 All the events attracted a good number of competitors, no less than seventeen entering for the swimming race. By two o'clock, the time for starting, great crowds assembled and seated themselves on the grassy embankment surrounding the lake, the bright dresses and gay colours of the ladies' parasols making a scene not easily forgotten. 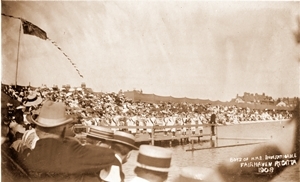 The programme opened by a sailing race for private boats, for a beautiful silver cup presented, by Mrs. L. Brown. Although six boats entered for the race only three put in appearance at the starting place. The first prize was won by "Annie," sailed by Mr. H. Crowe, "Little Marie," sailed by Mr. G.Rycroft, being second, and "Water Lily," sailed by Mr; S. Green, third. The swimming race followed, and seventeen competitors took their place on the diving stage. The distance swam was 240 yards across the lake. The first prize went to Mr. J. M. Gillett (10 secs. ), the second to Mr. W. Wilson (10 sees. ), and the third to Mr. G. Miller. The fine stroke of Mr. Gillett was very much admired. 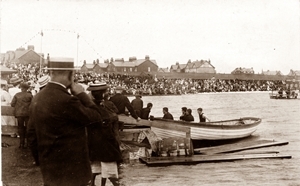 After this race, the members of the Lytham Swimming Club made up two teams for a polo match which was enjoyed by the onlookers. The pair-oared sculling race was rowed in three heats. The winners of the heats were J. Rainford, G. V. Rycroft, and N. Johnson. In the final, N. Johnson (St. Anne's) came out first, J. Rainford second, and G. V. Rycroft third. Three entries had 'been sent in for the ladies sculling race, but for some reason or other none of the fair competitors faced the starter, and so the race was declared off. The rowing obstacle race created a good deal of excitement, and there was much merriment at the way the competitors carried out their parts. The first prize went to Mr. T. Clarkson, the second to Mr. J. Rainford and the third to Mr. N. Johnson. The tub race came next, and the large crowd simply roared at the amusing spectacle of the men trying to keep their frail tubs righted. - The least “wabbling" being resented by the tubs which filled on the slightest provocation and precipitated their occupants in the water. However, by a process of sailing, walking, and swimming the race was completed, and the first prize went to G. Miller, the second to S. Myerscough, and the third to Thomas Newsome. The water events were varied by a sack race, which was won by J. H. Rycroft, H. Gillett and U.. Crowe being second and third respectively. The tenth event consisted of a walk on a greasy pole over the water, and this was perhaps the funniest sport of the day, as one after the other tried their luck, only to reluctantly tumble head over heels into the water below. One of the competitors elected to try his luck dressed in trousers and shirt, and his immersion caused roars of laughter. Nothing daunted, however, he continued the experiment until some wag suggested he was saving his washing bill. Eventually the hardly-contested prize was carried off by S. Myerscough, the second by G. Miller, M. Wignall and R. Clarkson winning the third and fourth prizes. During the afternoon and evening the Misses Daisy, Gladys and Stella Gardiner presided over a balloon competition. The entrance fee was 1s., which entitled the owner to a toy balloon inflated with hydrogen gas, and to each was attached a postcard asking the finder to post the card to Fairhaven. Immediately the balloons were released they floated away in the heavens, and as there was a nice breeze blowing they were soon lost against the background of beautiful pale blue clouds. The owner of the balloon that travels to the most distant place will be declared the winner. In the evening an immense crowd gathered to witness the lantern carnival. The night was an ideal one. The moon shed its pale radiance over the lake, and the breeze was warm and balmy. Prizes were offered for the best decorated boats, and although only three boats entered the competition, the sight as they glided over the still water, illuminated by Japanese lanterns with limelights flaring at intervals, was pretty in the extreme, not the least effective being the reflection of the multi-coloured lights from the lamps in the water. During this exhibition an old wreck was blazing away in the middle of the lake, giving a weird effect to the surroundings. Mr. Gardiner varied the exhibition by firing rockets front his boat. 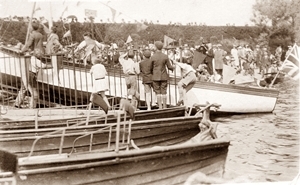 The crowd was not slow to appreciate the labour that had been bestowed upon the boats by the three competitors, and as they came close to the landing stage for inspection, all three boats were heartily applauded. Finally, the first prize was awarded to Mr. Gardiner, the second to Miss Shaw, and the third to Mr. Crowe. During the afternoon and evening the proceedings were enlivened by the music of the Lytham Volunteer Band. The sports, which had gone like clockwork from two o'clock in the afternoon were brought to a close just after half-past nine by the band striking up what they euphemistically call "The King." The evening was so bright, however, and the sports had been so thoroughly enjoyed that it was some time after ten o’clock - before the surroundings assumed their normal appearance. Admission to the ground was fee, but a collection was taken, which realised upwards of £5. We understand that a portion of the proceeds are to be devoted to the children's camp. WHALE WASHED UP AT FAIRHAVEN. We are evidently in the thick of the whale season. Last week we announced the forthcoming visit of Mr. F. T. Bullen, F.R.G.S., one of the, best authorities on whales, and since then two of the monsters have come up the Ribble, the first being caught on the Horse Bank, near Southport. the day following our announcement. About noon yesterday another whale was washed up on the beach at Fairhaven, about 150 yards inside the Urban District area of St. Anne's, and near the Fairhaven Marine lake outlet. The animal tho' not near so large as the one recently shot a measures about 13 feet from the end of its nose to the tip of it tail, and has a girth of about fourteen feet. It has evidently met its death through coming in contact with the screw of a passing steamer, for it is very badly cut about the neck and at the hack of the head. Otherwise the animal is in very good condition. Numbers of people visited the place yesterday afternoon and many were not content with the sight of the huge fish, for they began to hack at its body, probably for mementos of the rare visit of a king of the deep. The St. Anne's Council will probably undertake the funeral obsequies at noon to-day, so there is just a possibility of readers getting a glimpse of the monster before it disappears.